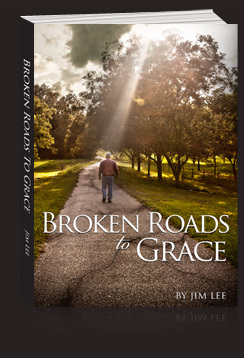 The book “Broken Roads to Grace” is “a Christian book for people who don’t usually like to read Christian books.” It is really an easy read as books go, with short chapters and a simple conversational style. (The last time I tried to write a profoundly deep theological lecture , all I did was give myself a headache). What you will find in these pages are mostly the thoughts and experiences of a minister who was taught to be very religious but finally discovered that it was more important to just be real. This is largely about my search for authenticity. Sometimes I have found that authenticity, and sometimes I haven’t… but I have come close enough to want to write about it even as the search continues on the broken roads of my own life. It is 48 chapters, 272 pages. It is not “preachy” or self-righteous, and I did not try to make myself look good. It is essentially a book of stories – some of them funny, and some of them painful, but all of them point the way for us to experience a more genuine spirituality. I have written it for people who desire to welcome a message of grace, honesty, and forgiveness into their lives, because they understand that self-righteous religion really stinks. In the pages of Broken Roads to Grace I hope that you will find some down-to-earth, interesting insights that will relate to you. They come from a lifetime of Biblical studies and ministry, but also from a realization that you and I are worse than we thought we were, but God’s grace is radically amazing beyond our wildest dreams! Best wishes, and whether you buy a book or not, thanks for checking it out.